I hope you enjoyed last week`s article about robot.txt files. We helped find three instances for other clients that were preventing Google and other search engines from indexing their site. For this week`s tip, we`ll make sure that the default title tags aren`t set improperly. Let me know if you`d like assistance with your search marketing needs. We have an amazing, talented team who know how to make Magento commerce websites appear top in results in search engines. However, this doesn`t help you at all. What Are Title Tags, and why do they matter? 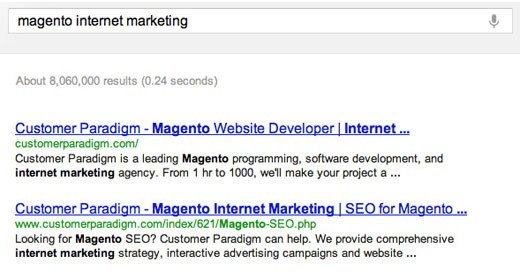 When you search in Google, the search results on the next page each start with a blue underlined link. What displays in this blue link is usually what is contained in the title tag of a web page. The keywords you placed in the search box are usually boldfaced in the search results. Instead of a title like “Introduction”, which doesn`t provide much contextual background, web designers should supply a title such as “Introduction to Medieval Bee-Keeping” instead. Most end users won`t see the title tag*. But if you remember back to my email tip about subject lines, the title tag is what a subject line is to an email campaign: It entices the end user to pay attention and open the page to read more. 1. Untitled: When many of the popular programs create a new HTML page, it puts `Untitled` into the title tag. It`s up to the Web designer to change this… and since most users don`t see it, sometimes they forget to change it. … then you don`t have a title tag. This is sure to get more keywords into the title tag, and if you`re searching for a company, you instantly know what they do. 4. No Company Name In Title Tag: We recommend putting your company name at the beginning of the title tag, so that people can quickly see your company`s name when they search. 5. Same Title Tag on Multiple Pages: You should have a unique title tag for each page of the site. Why? As each page is unique, you should have a title tag that describes it`s unique content. Let me know if we can help better optimize your title tags for your site.